"Inside Michigan Football" is the title of the next generation "Michigan Replay", which as we all know, died a quiet death at the end of the Lloyd Carr administration after a 30+ year run. There's not many folks out there who were too sad to see Michigan Replay go away. Sure, it was a great show for us die-hards. But a half hour of Brandy and Lloyd waxing poetic about the game that was, got a tad dry and stale. Lloyd was not a big fan of the camera. So, in keeping with the routine in Ann Arbor this year...out with the old and in with the new. "Inside Michigan Football" will be a new show hosted by Brandy and Rich Rod of course. Doug Karsch will be added the show's lineup...as a roving-reporter I assume. 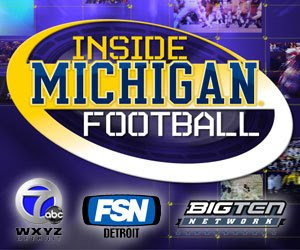 The show will air on August 28th at 6:30pm on FSN Detroit, and will be replayed on ABC-7 and the Big Ten Network. Because of legal stipulations, it will not be posted on mgoblue.com. 15 episodes in total will air over the season following the same schedule every week. However, a program called "Michigan Rewind" will air on mgoblue.com after games and will feature 8 to 10 minutes of highlights, analysis and interviews with coaches and players. All I ask is that they keep the vintage Michigan Replay music...that was pure gold! Nothing says Michigan football like 70's R&B music!